First of all, I agree with a few other readers out there that this book was probably not the best book to listen to as an audio book. In fact, I might concede that point with all of the Sherlock Holmes I've listened to so far. 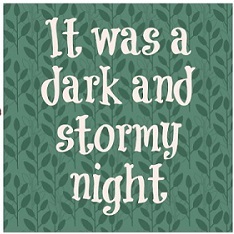 I might have been a little more entertained if I had actually read The Hound as a print book. But I love Simon Vance's narrations--he has such an excellent way of handling his male and female voices, and he absolutely surprised me with the few American characters from A Study in Scarlet during that strange Utah/Mormon tangent, as well as the voice of Sir Henry in this book. In fact, there was a scene wherein Dr. Watson stumbles upon a surprising visitor, and with Simon Vance's different intonations, I immediately knew who the surprising, mysterious visitor was without having to be told. And I got a little excited! 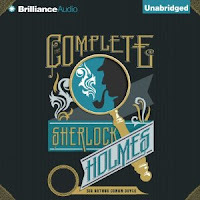 And also, I spent an Audible credit on this audio book, so I will persevere with the rest of the Sherlock Holmes stories in it. I may just have to find myself a print book to follow along with if I get confused. 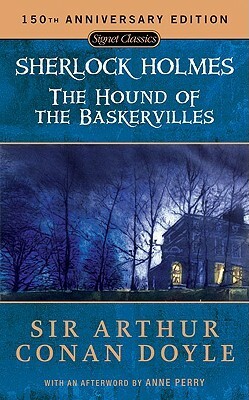 Because confused I did get, indeed, at the beginning of The Hound of the Baskervilles. In fact, I actually had to start the audio book over three times because my brain wandered a little bit. Then I told myself that I need to pay attention to the book rather than multi-tasking while listening to the book--a problem I'd never had before except with one other book that I never finished listening to. Anyway, even with me paying attention, the book DID have a fairly slow start-up after the initial, intriguing opening with Dr. Mortimer. But then Sir Henry started going on and on about his brand new boots, and then I got lost. Then we entered the Baskerville home and things felt like they were getting interesting again... but I ended up setting the book aside in favor of listening to music while I drove to work, or did piddly chores around the house, or worked on my blog. To be honest, the mystery was an interesting one, but not a story I feel like needed to be 5 hours long. The atmosphere was excellent, I'll give it that. And I DO like Dr. Watson and seeing him set off on the investigation on his own while Sherlock Holmes does his own thing. But really, the book didn't pick up until the two are reunited and Holmes starts doing his super-investigating. As much as I am a little put off by Holmes's arrogance sometimes, he has a way of making it come off kind of charming at the same time--it's to the point where I'm not sure whether or not I like that Holmes is irritatingly arrogant or not. Because his arrogance is pretty deserved considering how good he is at his detecting work. It's enjoyable, but not something I'd come back to anytime too soon. I'm still in love with Simon Vance's narration. I'm a terrible buddy read participant as I have not participated in any of the discussions of this book since the official Buddy Read started at Booklikes.